Lapis lazuli is actually an opaque conglomerate of dark blue lazurite streaked with white calcite, or sprinkled with gold specks of pyrite. Lapis may also include small quantities of augite, diopside, mica, and hornblende. Lapis belongs to the isometric crystalline system and has a hardness of 5 - 6. Spiritually it strengths the desire for truth. 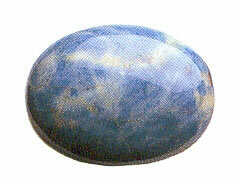 With its steady, penetrating energy, Lapis helps you look at things you are unable to complete. When you are ill and don't know the reasons, Lapis is one of the stones that can help you become aware of the issues.